I spend a lot of time working at my desk. Lucky for me, there’s usually cat within arm’s reach because Pierre likes to hang out on my desk while I work. That means he’s always there for me. When I’m too busy to take a break, I can run my fingers through his fur and feel his purr. 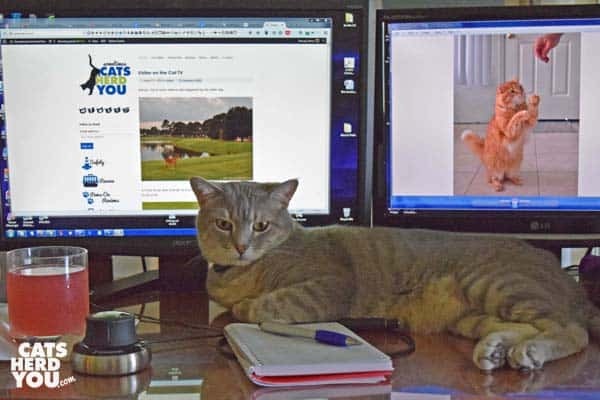 Of course, there are some drawbacks to having your cat choose the spot between you and your computer monitor, too. It can be easy to let myself get sidetracked from work and just pet Pierre. He wouldn’t complain about that even a little bit. If Pierre thinks I’m not paying enough attention to him, he first tries rolling over and looking adorable. If that doesn’t work, he has learned that standing between me and the words I’m trying to see usually gets results. Who can resist a cat asking for more scritches? The ideal solution would be to relocate him to the other arm of my L-shaped desk. It’s the one with the better view. But Pierre doesn’t want the view. He wants the attention. So I needed a way to make the other arm of my desk more comfortable for him than the part in front of my computer monitors. I needed something for Pierre that had a small enough footprint to fit on my desk and leave room for my internet router behind it. But it also had to be so irresistible that he would rather be there than between me and my computer monitor. 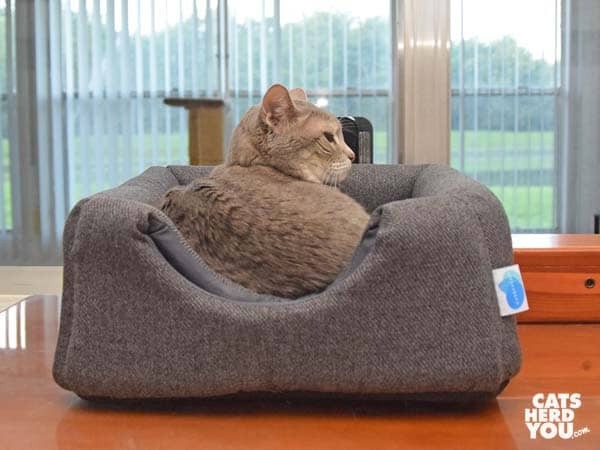 What I found was the MessyCats 2-in-1 Cuddler Bed. Pierre is ignoring me because his bed is even better than interfering with my work. Pierre likes being able to be close to me and still have his own, cozy space. He can look out the window into our sunroom and through that room’s windows watch the birds and wildlife beyond. It’s the best of all worlds for him. The bed has a cushioned bottom than the hard surface of my desk. The fabric of the bed has Everfresh probiotic embedded in it to prevent odor. Not that Pierre smells, of course. He leaves that to the dogs. But you never know where a hairball might show up, and this bed will never get the “hairball was here” funk. The cuddly walls of the bed that Pierre enjoys snuggling into are especially thick because the bed converts into a house. Those thick walls are actually doubled over walls for the house. When the house pops up, it makes a cozy hideaway. 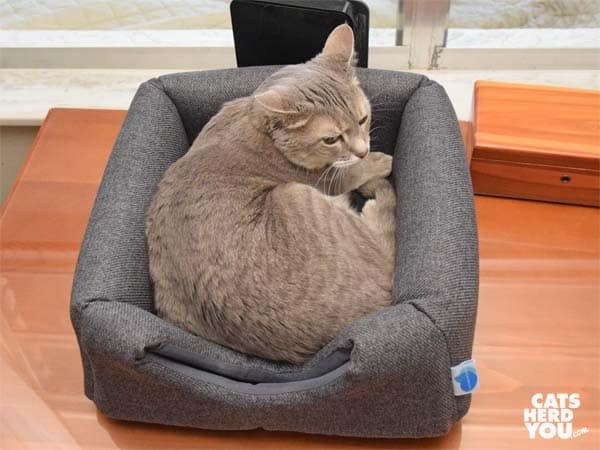 Pierre loves to sleep in enclosed places, so he really likes the bed in this configuration, even if it means he doesn’t have a panoramic view. I guess his eyes will be closed anyhow, so the view isn’t so important. Pierre is a senior cat and is less tolerant of cooler temperatures as he ages, and I like how his body heat quickly warms the hideaway for him. I’ll use the bed in the hideaway configuration on cold days so he has warm, cozy spot to hang out next to me while he supervises my work. The rest of the time, I can keep the bed in its cuddler configuration so it doesn’t interfere with my view or his of the windows. I love the flexibility of the bed, and Pierre thinks it’s the best thing ever to happen to my desk. The best part is that I can see my computer monitors again. We all win! 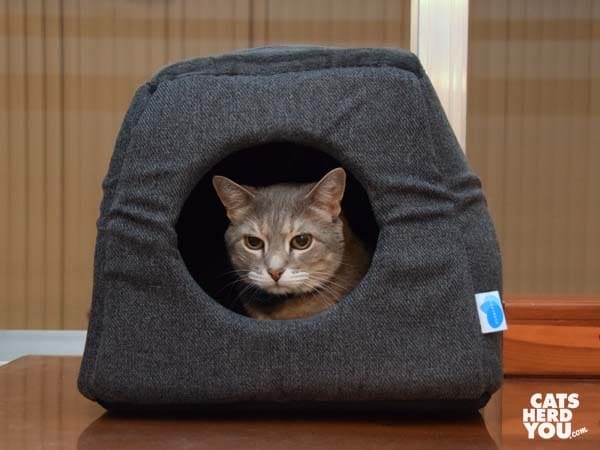 The MessyCats 2-in-1 Cuddler Bed is made by our Canadian friends, MessyMutts. 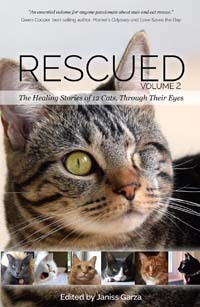 You can find it at Amazon. 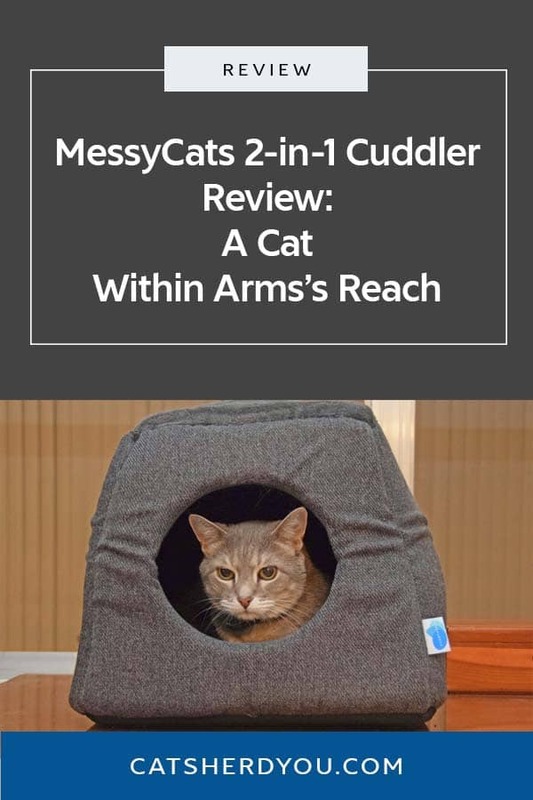 FTC Disclosure: I received the MessyCats 2-in-1 Cuddler Bed for review at no charge. This didn’t influence what I said about the product. All opinions in this review are my own and not influenced by any outsider. I receive no additional benefits for talking about the products or company. This post contains affiliate links, which means we receive a small percentage if you make a purchase. That is a very cool bed! My human keeps her desk so messy that there’s no room for a kitty, much less a bed… I’m not sure if she planned it that way or if she’s just a slob. You sure look comfy cozy in your new work space Pierre! What a cool bed! And a great way for Pierre to be comfortable while you work. Pawsome bed. 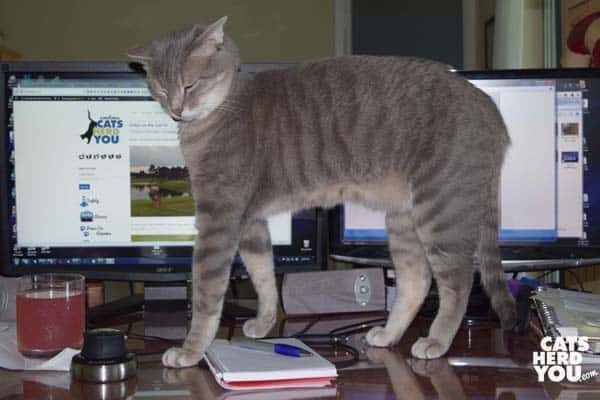 Allie likes to stand right in front of the monitor! what a cute post and I think that bed looks great! Love how it converts into a little cave too, brilliant idea! Oh and of course, Pierre makes it look EXTRA comfy! We definitely need a few new cat beddys around the house, even if Da Boyz seem to think cardboard boxes are the cat’s meow! Thanks for the review, and nice job of modeling, Pierre! What a fabulous bed! I don’t use a desk at home, just my laptop on the couch, but if I did have a desk to work at I’m sure Mudpie would act the same way as Pierre!